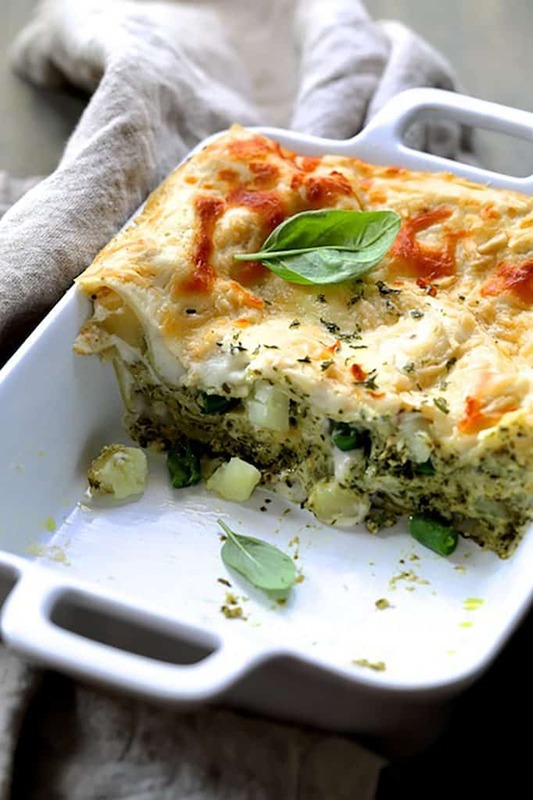 Lasagna with Pesto, Green Beans and Potatoes is the perfect way to use the rest of this year’s fresh basil. 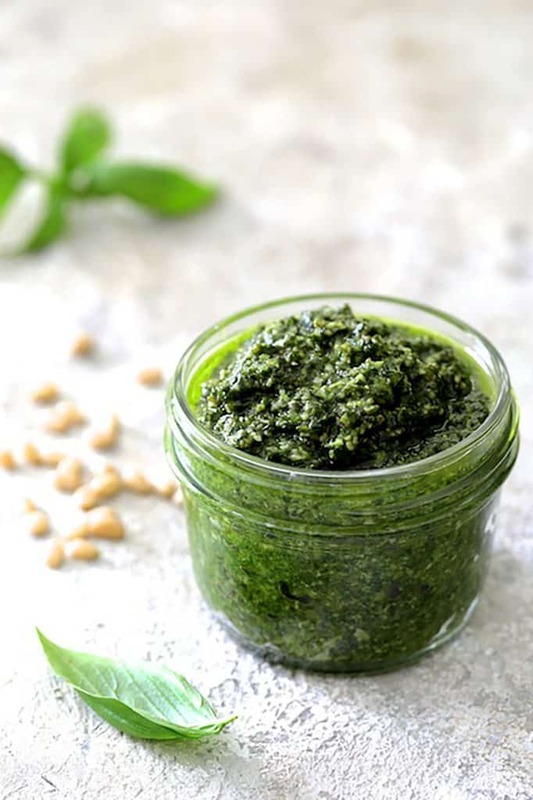 If you froze pesto, make this anytime for a taste of summer all year long! At least once during the summer, I do my annual “pesto project.” This takes the better part of an afternoon. Cut the plants back but leave some for future enjoyment, then immerse the stems in a full sink of water. Dirt falls to the bottom and insects meet their demise. Pick all the leaves off the stems. This takes a lot of patience! There are hundreds and hundreds! Spread the leaves out on several clean kitchen towels and let them air dry for an hour or two before making pesto. Basil has a tendancy to hold onto water and you don’t want that water in your pesto. Combine in a food processor and process until smooth. However, when preparing pesto for the freezer, I don’t add cheese or garlic but rather do it when I want to use the pesto. Freeze in small containers for a taste of summer when the snow is flying! Homemade pesto will turn a funky color; it’s just the nature of fresh basil. You could try blanching it briefly, but the bright flavor will be diminished. After thawing a container of pesto, scrape the oxidized portion off to reveal bright green pesto underneath. I made this Lasagna with Pesto, Green Beans and Potatoes with the last of our fresh basil. 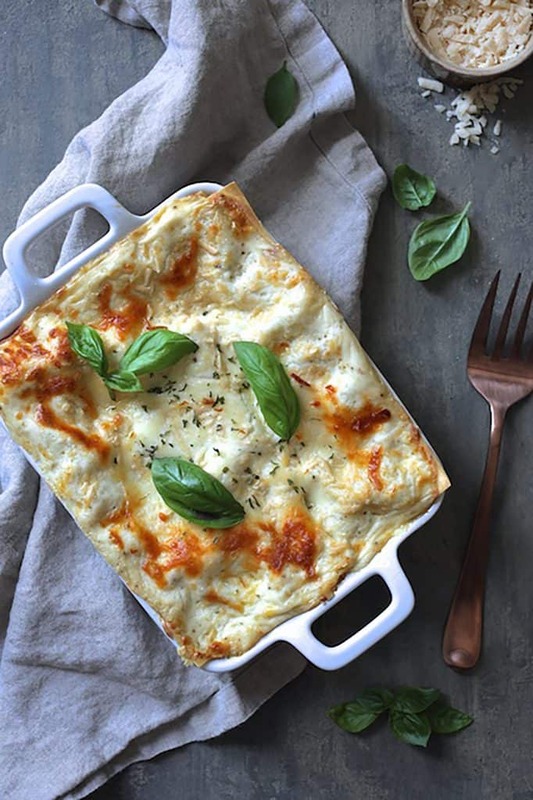 My hubby and I have a wedding anniversary coming up and this lasagna reminds me of a trip we took to Spain and Italy for our tenth wedding anniversary. When we visited Rome, we wanted to get away from the touristy-type restaurants in the piazzas. We came upon a tiny place in an alley that looked like it was a local hangout. It was a great choice! I ordered a pesto lasagna similar to this one and practically licked my plate! Ever since then, I’ve been obsessed with recreating that memorable lasagna made with a classic Italian trio: Pesto, green beans and potatoes. This is my version. If you froze a lot of pesto like I did, it’s a great way to use it. 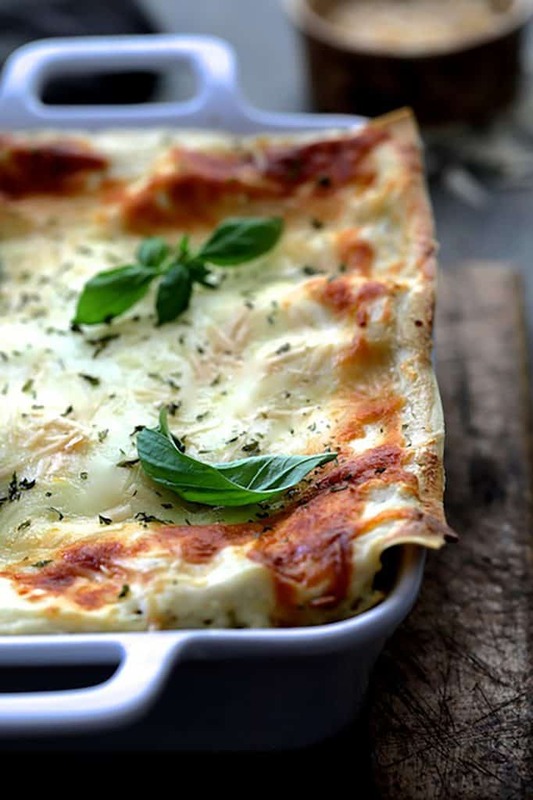 This lasagna made with my Radish Greens Pesto would also be amazing! The lasagna I enjoyed in Rome was made with silky, fresh pasta sheets. Make fresh pasta if you like, but to make my life easier, I used dried oven-ready lasagna noodles. You want to soak the dried lasagna noodles in hot water first. Otherwise, they soak up too much of the sauce. After cooking the potatoes and green beans, drain them but save the hot water. Pour it into a bowl or loaf pan and soak the noodles in that water to conserve resources. Top off with a little hot tap water if necessary. Remove them when pliable and blot dry on a clean kitchen towel or paper towels. This recipe is for only four servings, which makes it perfect for an intimate get-together or family dinner without leftovers. Hope you enjoy and let’s eat!! Here are more great Italian-inspired pasta dishes I think you’ll love! This small-scale Lasagna with Pesto, Green Beans and Potatoes is the perfect way to use the last of your fresh basil or any pesto you froze. Preheat oven to 375 degrees. Brush or spray a small shallow baking dish with cooking spray. Set aside. Fill a medium saucepan about half way with water; add the potatoes and 2 teaspoons salt. Bring to a boil and cook the potatoes about 5 to 8 minutes or until just starting to become tender. Add the green beans and continue cooking another 5 minutes or until potatoes and beans are tender. 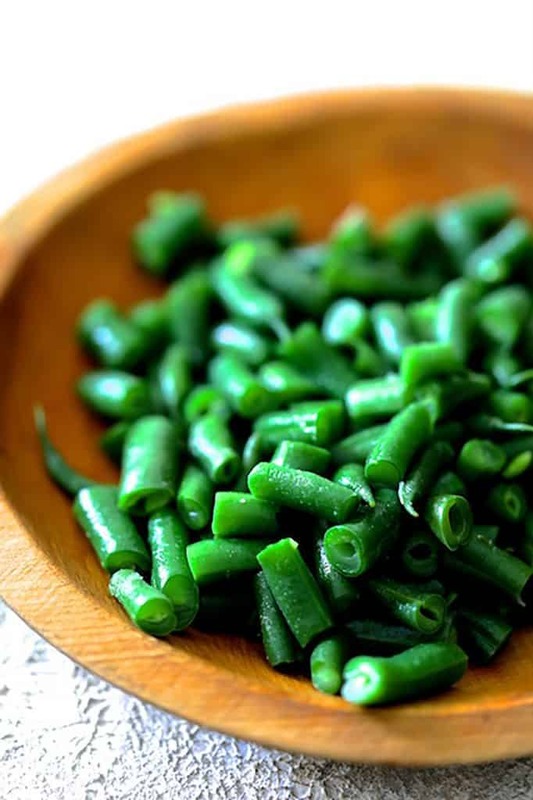 Strain the potatoes and green beans, reserving hot cooking water in a bowl or pan. Run cold tap water over the vegetables to cool; set aside. Place the lasagna noodles in the reserved cooking water to soften. Add additional hot tap water to cover if necessary. Move them around periodically to prevent them from sticking together as they soften. As soon as they are pliable, drain and pat dry with paper towels. Whisk together pesto and ricotta cheese until smooth; set aside. Make the béchamel: Melt butter in a saucepan over medium-high heat. Add the flour and cook 1-2 minutes, whisking constantly. Slowly stir in the milk, whisking constantly. Bring to a boil, reduce heat and simmer until thickened, whisking often. Add nutmeg and salt and pepper to taste. 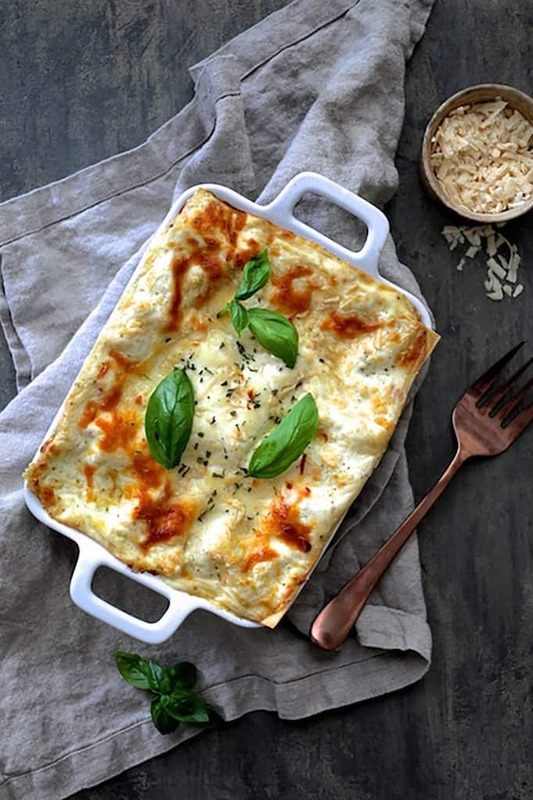 To assemble: Place a small amount of the béchamel in prepared baking dish (enough to cover the bottom) and 4 tablespoons pesto-ricotta mixture. Top with two of the noodles, arranging however they best fit the baking dish. Cover with 1/3 of the béchamel, half of the remaining pesto-ricotta mixture and half of the green beans and potatoes. Sprinkle with 2-3 tbsp. of each of the cheeses. Repeat layers again, finishing with remaining béchamel and remaining cheese. Cover loosely with nonstick aluminum foil. Bake 30-35 minutes. Remove the foil and continue baking another 10-15 minutes or until bubbling and top is lightly browned. Let stand 5-8 minutes before serving. Wow this is delicious!! Thank you!! I did a few things different and it still came out amazing. 1) I used lasagna sheets that needed to be boiled 2) I used 15 oz ricotta 3) I put 1 extra potato and slightly more green beans 4) I added some gruyere to my bechamel 5) I added 1 more garlic clove to my pesto. Flavors were fantastic!! Thanks, Jasmine! So glad you enjoyed! 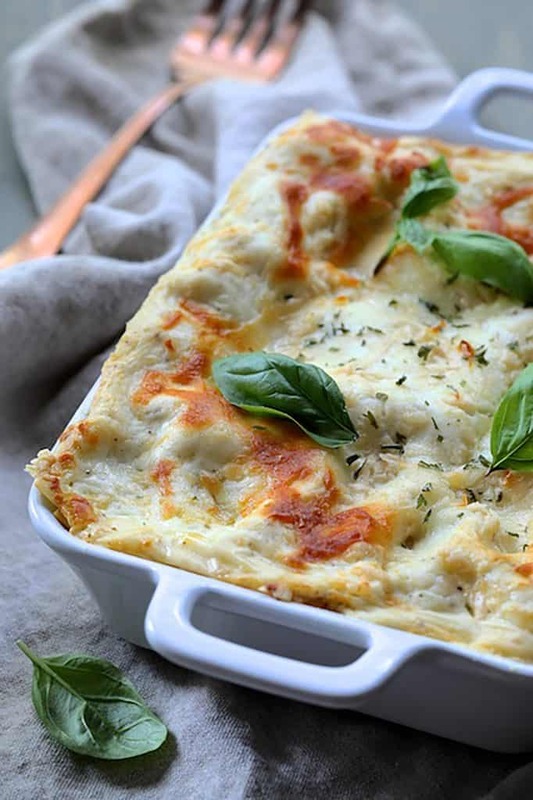 Lasagna is one of those things that you can play around with and make it your own. Thanks again and please stay in touch! Can this dish be made ahead of time and then frozen or refrigerated to be reheated a couple of days later? Hi, Elizabeth, Thanks for your question! Yes to both. The only thing is the pesto is going to turn dark, which it has a tendance to do anyway. If you don’t mind that, it will be fine. You could also use a kale or spinach pesto which would stay green. Thanks again and hope you enjoy!